About 90 members of the Morrisville and Cary 1st wards of the Church of Jesus Christ of Latter Day Saints came to Jordan Lake on successive Saturdays (May 4 and May 11) to combine community service with fun family activities. 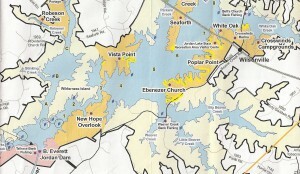 They rented picnic shelters and campsites within the Jordan Lake State Recreation Area and worked hard for a couple hours to remove litter at Ebenezer Church, Poplar Point, Crosswinds, Seaforth and Vista Point Areas(see brown-colored areas on map below). The yellow highlighting identifies the targeted shorelines. The small group of adult volunteers shown in the photos car pooled a short distance from the Vista Point Area to clean a section of Wilderness Island. Just last year our volunteers had cleaned here. However trash continues to accumulate from upstream sources on the Haw River. Staff from the Jordan Lake State Recreation assisted n planning the activity. About 85 bags of trash were removed. With budget cuts to state agencies, keeping up with litter can be difficult within our state parks. The success of these community service days shows the power of volunteerism.